November was an interesting month as developments in economy and finances brought some surprises: the main one is the drop of the oil prices, that positively affect to consumption, but it put at risk the economic viability of fracking and other alternative oil ventures. There is an open war between Arabian countries and other producers as US and Canada which colaterally affect Russia and Venezuela, for instance. 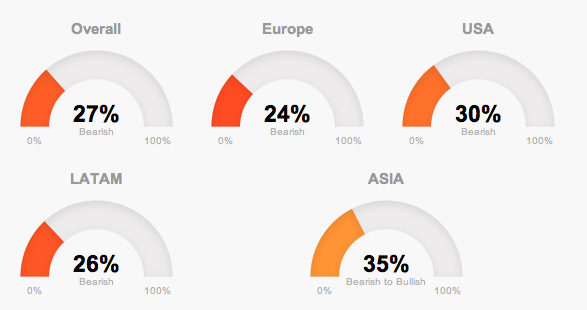 Global market trends in November were quite positive. US stock markets are still in peaks. In Europe, after the volatile October, last month was better with the outlook of a soon action from the ECB. LatAm and Asia are also obtaining benefits from the positive stream in the developed markets. The trend change between October and November was very clear. But what about 2015? What do experts say about the outlook for next year? Generally speaking, economic figures will be positive, as world expected growth will outpace the 3% bar, but IMF is pessimistic about recovering the former pace before the current crisis. USA: it is taken for granted that the Federal Reserve will increase rates. This decision will strengthen the dollar as currency against euro and others. It is also expected that US will be again the engine for the economic development in the world. Opinions about market evolution are also positive, although prices are in historic records. Europe: the point in the Old Continent is quite different. US abandon the expansive monetary policy and Europe is adopting it. There is an internal fight amongst some EU members (mainly Germany and France) about the next steps. Poor economic projections affect France and Italy, which are pressuring for quicker monetary policy decisions to boots their development. LatAm: many of these countries are depending on commodities and foreign investments. Brazil is again in recession, Argentina still fights with its eternal debt troubles. Next US rate hike and a more expensive dollar will make this region more volatile. Asia: Abenomics in Japan are not working as expected. Japan lives also an eternal stagnation and next election will surely not solve anything. Two key countries will also have important developments next year: China and India. China presented last months mixed figures about economic progress, while Modi’s government is expected to favour business, making India a stronger economic pole in the continent. This entry was posted in Our Charts and tagged 2015, Asia, Europe, global trends, Latam, USA on December 5, 2014 by Oscar Garcia.